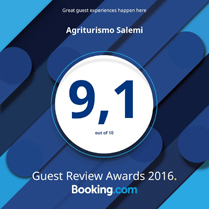 The Agriturismo Salemi is located in the green and picturesque district of Leano, few kilometres away from the town of Piazza Armerina. Thanks to regular and careful restoration works, this lovely 19th century farmhouse maintains its ancient beauty. It offers comfortable air-conditioned rooms with TV and minibar, and well equipped indoor and outdoor facilities, such as a swimming pool with a fantastic view on the landscape, a wide terrace shaded by beautiful olive trees and a big garden equipped with barbecue and wood-fired oven for delicious tastings.